Start off your visit on the 20th (Sat): get outside with Omaha Beach, then steep yourself in history at Pointe du Hoc, then admire the striking features of Notre Dame Cathedral, and finally look for gifts at Au Fin Gousier. On the 21st (Sun), you'll have a packed day of sightseeing: learn about all things military at Memorial of Caen, then take in the history at Musee du Debarquement Utah Beach, and then take an in-depth tour of Airborne Museum. To see ratings, reviews, where to stay, and more tourist information, go to the Bayeux online trip itinerary builder . Minneapolis, USA to Bayeux is an approximately 15-hour combination of flight and train. You can also fly. Traveling from Minneapolis to Bayeux, you'll lose 7 hours due to the time zone difference. Expect a daytime high around 58°F in April, and nighttime lows around 40°F. Finish your sightseeing early on the 21st (Sun) so you can drive to Perros-Guirec. Kick off your visit on the 22nd (Mon): examine the collection at Ecomusee de Plouigneau, take in the architecture and atmosphere at Eglise Saint-Etienne de Plouezoc'h, then contemplate in the serene atmosphere at Chapelle Notre-Dame du Yaudet, then make a trip to Sentier des douaniers, and finally appreciate the extensive heritage of Grand Site Naturel de Ploumanac'h. Keep things going the next day: enjoy the sand and surf at Tregastel - la Greve Blanche, then stop by Biscuiterie Menou, then pause for some serene contemplation at Eglise Saint-Theodore, and finally get a taste of the local shopping with L'imagerie. To find ratings, other places to visit, where to stay, and more tourist information, you can read our Perros-Guirec trip builder site . Getting from Bayeux to Perros-Guirec by car takes about 3.5 hours. Other options: do a combination of train and bus; or take a train. In April, plan for daily highs up to 56°F, and evening lows to 43°F. Finish your sightseeing early on the 23rd (Tue) so you can drive to Blois. Kick off your visit on the 24th (Wed): explore the historical opulence of Chateau Royal de Blois, then pause for some serene contemplation at Mairie, and then step into the grandiose world of Chateau de Cheverny. Get ready for a full day of sightseeing on the 25th (Thu): learn about winemaking at Domaine du Croc du Merle, then look for gifts at Poterie Agny, and then do a tasting at Plou Et Fils. For ratings, where to stay, and tourist information, use the Blois itinerary maker site . You can drive from Perros-Guirec to Blois in 5 hours. Alternatively, you can take a train; or take a bus. April in Blois sees daily highs of 60°F and lows of 40°F at night. Wrap up your sightseeing on the 25th (Thu) to allow time to take a train to Paris. To see maps, ratings, and tourist information, refer to the Paris road trip tool . You can take a train from Blois to Paris in 1.5 hours. Other options are to drive; or take a bus. In April, plan for daily highs up to 60°F, and evening lows to 42°F. You'll set off for Sarlat-la-Caneda on the 26th (Fri). Start off your visit on the 27th (Sat): step into the grandiose world of Chateau de Beynac, explore the historical opulence of Chateau des Milandes, and then step into the grandiose world of Chateau de Castelnaud. 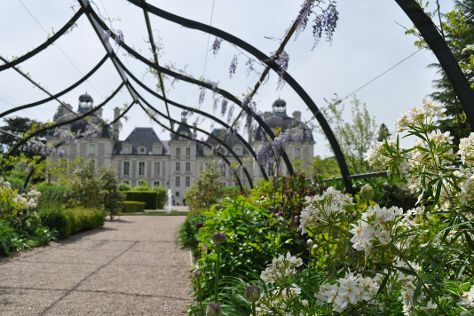 Get ready for a full day of sightseeing on the next day: see the interesting displays at Musee Zadkine, browse the fresh offerings at Cazals Market, then don't miss a visit to Le Chateau de Belves, then look for gifts at Kanovera, and finally explore the historical opulence of The Maison Forte de Reignac. For traveler tips, maps, and other tourist information, refer to the Sarlat-la-Caneda trip itinerary planning website . You can fly from Paris to Sarlat-la-Caneda in 3.5 hours. Alternatively, you can drive; or take a train. Traveling from Paris in April, you will find days in Sarlat-la-Caneda are somewhat warmer (66°F), and nights are about the same (41°F). Wrap up your sightseeing on the 28th (Sun) to allow time to travel to Avignon. Start off your visit on the 29th (Mon): delve into the distant past at Roman Theatre of Orange, then admire the striking features of Chateau des Baux de Provence, then admire the masterpieces at Musee Departemental Arles Antique, and finally steep yourself in history at Amphitheatre (les Arenes). On the 30th (Tue), you'll have a packed day of sightseeing: look for gifts at Le Caviste de Maussane, take an in-depth tour of Site Archeologique de Glanum, and then view the masterpieces at Anne Virlange Art Gallery. For traveler tips, reviews, more things to do, and tourist information, refer to the Avignon trip itinerary tool . Getting from Sarlat-la-Caneda to Avignon by combination of flight and train takes about 4 hours. Other options: drive; or do a combination of train and flight. In April, daily temperatures in Avignon can reach 68°F, while at night they dip to 46°F. Cap off your sightseeing on the 30th (Tue) early enough to travel back home.